این مقاله سعی دارد به بررسی ارتباط میان سرمایه فکری با جریان‌های نقدی عملیاتی و ارزش افزوده خالص به عنوان شاخص‌های ارزیابی عملکرد شرکت‌های پذیرفته شده در بورس اوراق بهادار تهران طی سال‌های (1386-1383) بپردازد. داده‌های مربوط به این دوره و همچنین اطلاعات مورد نیاز جهت اندازه‌گیری سرمایه فکری با استفاده از اطلاعات مندرج در صورت‌های مالی شرکت‌های مورد مطالعه و مراجعه به پایگاه اطلاعاتی سازمان بورس اوراق بهادار مربوط به سال‌های مورد نظر به دست آمد. جهت بررسی ارتباط میان سرمایه فکری،‌‌ جریان‌های نقدی عملیاتی و ارزش افزوده شرکت‌ها،‌‌ از فرم تبدیل شده تابع تولید کاب - داگلاس و برای بررسی معنی‌دار بودن رابطه علت و معلولی دو طرفه بین متغیر‌های توضیحی مستقل و وابسته از آزمون علیت گرنجری استفاده شد‌. نتایج به دست آمده از تخمین مدل برای شرکت‌های منتخب نشان می‌دهد که در دوره مورد مطالعه، بین جریان‌های نقدی عملیاتی‌،‌‌ سرمایه فکری و ارزش افزوده رابطة‌ مثبت و معنی‌داری وجود داشته و به طور کلی در یک اقتصاد دانش محور،سرمایه فکری به عنوان مهم‌ترین مزیت رقابتی و تأثیر‌گذار بر روی عملکرد سازمانی شناخته می‌شود. The present study attempts to assess the relationship between Intellectual Capital, operational cash flow and net value added of companies admitted in Tehran stock exchange during the period 2004-2007 Related data are collected from Tehran stock exchange database and also annual financial statements of the above mentioned companies for the same period. Transformed logarithmic form of Cob Douglas production function and also pair wise Granger causality tests have been applied to investigate the relationship between intellectual capital, before taxation profit, operational cash flow and value added. Results indicate that there is a positive and significant relationship between intellectual capital, before taxation profit, operational cash flow and value added of the companies enlisted in Tehran stock exchange during the period of study. 1. رحمانی، تیمور؛ حیاتی، سارا؛ «بررسی اثر فناوری اطلاعات و ارتباطات بر رشد بهره‌وری کل عوامل تولید: مطالعه بین کشوری»، فصلنامه پژوهش‌های اقتصادی ایران، 1386، شماره 33. 2. 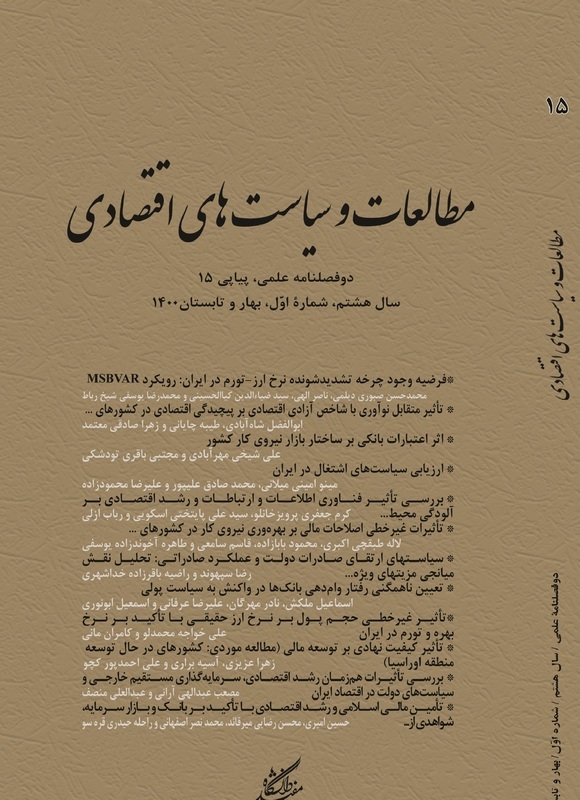 شاه‌آبادی، ابوالفضل؛ کمیجانی، اکبر؛ «بررسی اثر فعالیت‌های R&D داخلی و خارجی (از طریق تجارت خارجی) بر بهره‌وری کل عوامل تولید»، پژوهشنامه بازرگانی، 1380، شماره 5 (18). 3. شاه‌آبادی، ابوالفضل؛ «اثر سرمایه‌گذاری مستقیم خارجی، تجارت بین‌الملل و سرمایه انسانی بر بهره‌وری کل عوامل اقتصاد ایران»، دو فصلنامه جستارهای اقتصادی، 1386، شماره 4 (7). 4. طیبی، سید کمیل؛ عمادزاده، مصطفی؛ شیخ بهایی، آزیتا؛ «تأثیر صادرات صنعتی و سرمایه انسانی بر بهره‌وری عوامل تولید و رشد اقتصادی در کشورهای عضو OIC»، فصلنامه اقتصاد مقداری، 1387، شماره 5 (2). 5. محمودزاده، محمود؛ اسدی، فرخنده؛ «اثرات فناوری اطلاعات و ارتباطات بر رشد بهره‌وری نیروی کار در اقتصاد ایران»، پژوهشنامه بازرگانی، 1386، شماره 11 (43). Aghion, Philippe & Howitt, Peter, "A model of growth through creative destruction", Econometrica, Vol. 60(2), 1992, 323-351. Apergis, Nicholas & Economidou, Claire & Filippidis, Ioannis, "Innovation, technology transfer and labor produvtivity linkages: evidence from a panel of manufacturing industries", Tjalling C. Koopmans Research Institute, 2008, Discussion Paper Series 08-29. Aubyn, Miguel St, "Modernising public administration and economic growth", GPEARI Working Paper WP-001, 2008. Baier, Scott L & Gerald P Dwyer & Robert Tamura, "Factor returns, institutions and geography: a view from trade", 2006. Baldwin, John R, "The importance of research and development for innovation in small and large Canadian manufacturing firms", 1997. Barro, Robert J & Lee, Jong-wha, Data set for a panel of 138 countries. CID, Harvard University, 2000. Barro, Robert J & Xavier Sala-i-Martin, Economic growth, McGraw Hill, 2004. Basant, Rakesh & Simon Commander & Rupert Harrison & Naercio Menezes-Filho, "ICT adoption and productivity in developing countries: new firm level evidence from Brazil and India", Institute for the Study of Labor (IZA), 2006, Discussion Paper No. 2294. Bogliacino, Francesco & Pianta, Mario, "The impact of innovation on labor productivity growth in European industries: does it depen on firm’s competitiveness strategies? ", 2009. Buse, Florian, "The effect of knowledge on the economic growth", Annals of the University of Petrosani, Economics, Vol. 4, 2004, 37-44. Cainelli, Giulio, "Spatial agglomeration, technological innovations and firm productivity: evidence from Italian industrial districts", Journal of Growth and Change, Vol. 39 (3), 2008, 414-435. Carine, Peeters & Pottelsberghe, Bruno Van, "Innovation capabilities and firm labor productivity", University Libre de Bruxelles and Solvay School and Centre Emile Bernleim, 2004, Working Paper No.04030.RS. Cass, David (1965), "Optimum growth in an aggregative model of capital accumulation", Review of Economic Studies, Vol 32(July), pp. 233-240. Castiglione, Concetta (2008), "ICT investments and technical efficiency in Italian manufacturing firms: the productivity paradox revisited", Department of Economics of Trinity College Dubline, Working Paper No. tep0408. Chang, Chia-Lin & Robin, Stephane, "Using the asymptotically idea model to estimate the impact of knowledge on labor productivity: an application to Taiwan in the 1990s", 2006. Chansarn, Supachet, "Labor productivity growth, education, health and technology progress: a cross-country analysis", Economic Analysis & Policy, Vol 40(2), 2010, 249-261. Chen, Derek H.C. & Dahlman, Carl J, "Knowledge and development: a cross-section approach", World Bank Policy Research, 2004, Working Paper No. 3366. Coe, David T & Helpman, Elhanan, "International R&D spillovers", European Economic Review, May, Vol. 39(5), 1995, 859-887. Cörvers, Frank, "The impact of human capital on labour productivity in manufacturing sectors of the European Union", Reseach Centre for Education and the Labour Market (Maastricht), 1996, Research Memoranda No. 001. Crepon, Bruno & Emmanuel Duguet & Jacques Nairesse, "Research, innovation, and productivity: an econometric analysis at the firm level", NBER, 1998, Working Paper No. w6696. Edquist, Harald, "Parallel development? Productivity growth following electrification and ICT revolution", Reearch Institute of Industrial Economics, 2007, Working Paper 714. Goedhuys, Micheline, "The impact of innovation activities on productivity and firm growth: evidence from Brazil", Maastricht Economic and Social Research and Training Centre on Innovation and Technology, 2007, Working Paper No.002. Greene, W.H, Econometric ananlysis (fifth edition), Macmillan Publishing Company, New York University, 2005. Grossman, Gene M & Helpman, Elhanan, Innovation and growth in the global economy, Cambridge, MA and London: MIT Press, 1991. Haskel, Jonathan & Pereira, Sonia, Skills and productivity in the UK using matched establishment and worker data, Royal Economic Society Annual Conference 2003, Number 100. Hua, Ping, "How does education at all levels influence productivity growth? Evidence from the Chinese provinces", 2005. Johansson, Börje & Lööf, Hans, "The impact of firms’ R&D strategy on profit and productivity", Centre of Excellence for Science and Innovation Studies (CESIS), 2008, Working paper no 156. Kabubo-Mariara, Jane, "The linkages between property rights, migration and productivity: the case of Kajiado District, Kenya", Journal of Environment and Development Economics, Vol. 8(4), 2003, 621-636. Koopmans, Tjalling C, On the concept of optimal economic growth, In the Economic Approach to Development Planning, Amsterdam: Elsevier, 1965. Lederman, Daniel, "Product innovation by incumbent firms in developing economies: the roles of research and development expenditures, trade policy and the investment climate", World Bank Policy Research, 2007, Working Paper No 4319. Lokshin, Boris & Rene Belderbos & Martin Carree, "The productivity effect of internal and external R&D: evidence from a dynamic panel data model", UNU-MERIT, 2007, Working paper 2007-026. Lopez-Acevedo, Gladys & Monica Tinajero & Marcela Rubio, "Mexico: human capital effects on wages and productivity", World Bank Policy Research, 2005, Working Paper No. 3791. Lucas, Robert Jr, "On the mechanics of economic development", Journal of Monetary Economics, Vol. 22(1), 1988, 3-42. Martinez, Diego & Rodriguez, Jesus & Torres, Jose L, "ICT-specific technological change and productivity growth in the US 1980-2004", 2008. Masso, Jaan & Vahter, Priit, "Technological innovation and productivity in late-transition Estonia: econometric evidence from innovation surveys", Faculty of Economics and Business Administration (University of Tartu), 2008, Working Paper No. 61. Maudos, Joaquin & Jose M. Pastor & Lorenzo Serrano Martinez, "Human capital in OECD countries: technical change, efficiency and productivity", International Review of Applied Economics, Vol. 17(4), 2003, 419-435. Meon, P-G, Weill, L, "Does better governance foster efficiency? An aggregate frontier analysis" Journal of Economics of Governance, Vol.6(1), 2004, 75-90. OECD, "The Knowledge-based economy", Paris, 1996. Oulton, Nicholas & Srinivasan, Sylaja, "Productivity growth in UK industries, 1970-2000: structural change and the role of ICT", Bank of England, 2005, Working Paper No. 259. Pianta, Mario & Vaona, Andrea, "Innovation and productivity in European industries", Università di Verona, 2006, Working Paper No. 34. Piatkowski, Marcin, "Does ICT investment matter for growth and labor productivity in transition economies? ", Econ WPA, 2004, No. 0402008. Rincon-Aznar, Ana & Vecchi, Michela, "The dynamic impact of ICT spillovers on companies' productivity performance", National Institute of Economic and Social Research (NIESR), 2004, Discussion Paper No. 245. Romer, Paul M, "Increasing return and long-run growth", 1986, Journal of Political Economy, Vol. 94 (5), 1002-1037. Romer, Paul M, "Human capital and growth: theory and evidence", Carnegie-Rocheser Conference Series on Public Policy, Vol. 32(1), 1990, 251-286. Romer, Paul M (1990), "Endogenous technological change", Journal of Political Economy, Vol 98(October), 1990, 1002-1037. Romer, Paul M, Advanced Macroeconomics,third edition, McGraw-Hill Press, 2006. Schmitz, James A, "Government production of investment goods and aggregate labor productivity", Federal Reserve Bank of Minneapolis, 1997, Staff Report No. 240. Sharpe, Andrew, "The Relationship between ICT investment and productivity in the Canadian economy: a review of the evidence", Centre for the Study of Living Standards (CSLS), 2006, Reseach Reports No. 05. Soderbom, Mans M & Teal, Francis John, "Openness and Human Capital as Sources of Productivity Growth: An Empirical Investigation", Development and Comp Systems, 2004, Number 0409031. Solow, Robert, "A contribution to the theory of economic growth", Quaterly Journal of Economics, Vol. 70, 1956, 65-94. UNDP, United Nations, Human development report, 2008. Viscusi, W Kip & Moore, Michael J, "Product liability, research and development and innovation", Journal of Political Economy, Vol. 101(1), 1993, 161-184. World Bank, World development indicators CD-ROM, 2007. Zack, M ichael H, "Developing a knowledge strategy", California Management Review, Vol. 41(3), 1999, 125-145.